A Hall effect sensor is a transducer that varies its output voltage in response to changes in magnetic field. Hall sensors are used for proximity switching, positioning, speed detection, and current sensing applications. 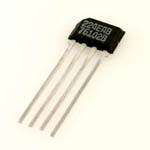 Once submitted, we will try and place you in contact with a suitable Hall Effect Sensors supplier within 48 hours. 65017 High Reliability Hall Effect Sensor from Micropac Industries, Inc.
H Series Oriented Hall Effect Speed Sensors from Motion Sensors, Inc.
BBHME301 Hall Effect Vane Sensors from BB Automacao Inc.